Nebraskans love the outdoors. With plenty of parks and excellent areas to hike, fish, run, and more, having the right gear and equipment is key. However, finding knowledgeable help when shopping for sporting goods can be tricky. Therefore, we put together the 10 best local sporting goods stores in Nebraska to help you find exactly what you need to get out there and get moving. Thurman’s Bike & Sport in downtown Nebraska City started in 1981 and has since expanded three times to its current storefront that now occupies over 6,600 square-feet. With a full line of bicycles and sporting goods, Thurman’s Bike & Sport is the only sporting goods store in Nebraska City that offers everything athletes need to succeed. Racquet Corner offers a wide variety of tennis supplies for beginners to pros. This sporting goods shop carries racquets, shoes, accessories, and apparel at reasonable prices. The staff is knowledgeable about the sport and can help you find anything related to tennis. Hilsabeck Sporting Goods in Holdrege carries a full line of sporting goods. From golf and baseball to football and soccer equipment, the shop has been serving the local athletic community since 1947. They also outfit youth teams and carry all of the top brands—as well as Husker gear for the biggest fans. Nebraska Sports in Lincoln is a friendly sporting goods store that carries a great selection of Husker gear and name brand equipment for every sport. If you’re heading to Memorial Stadium, be sure to stop in and stock up on Cornhusker apparel! Since 1976, Lincoln Running Company has been helping athletes find the right shoes and gear, whether they’re after comfort or top-of-the-line footwear to run a marathon. With a wide selection of running shoes and expert staff, at Lincoln Running Company you’re sure to get the perfect fit every time. Alive Outside is a friendly sporting goods store in North Platte that carries sporting equipment and gear directed towards biking and cycling. The store stocks a full line of bikes, as well as exercise equipment, clothing, and accessories. Best of Big Red has two locations in Lincoln and offers exactly what you might think it would—the best in Huskers merchandise and sporting goods. Owned by the Osborne family, this local favorite aims to provide the best Husker products to Cornhusker fans all over the state and the world. Bedlam’s Sporting Goods started over 60 years ago and offers hunting equipment with incredibly knowledgeable owners matched by few others. This throwback style sporting goods store also offers fishing and archery gear. Canfield’s Sporting Goods in Omaha is the best place to find camping, hiking, running gear and much more. 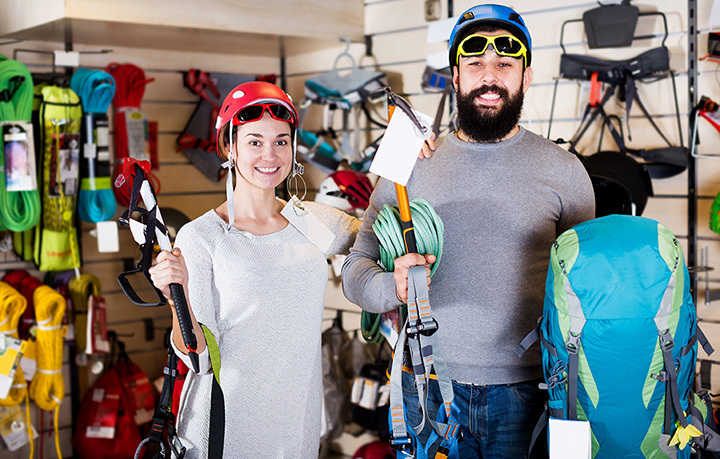 For outdoor enthusiasts, make this your first stop for all of your gear before you head out on your next adventure. Red Dirt Running Company in Omaha carries a top line of footwear and clothing for runners, walkers, or anyone looking to be more active and comfortable when hitting the pavement.